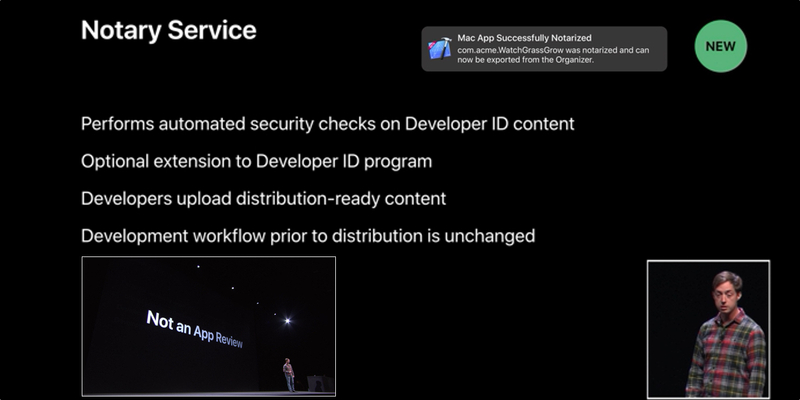 Apple、開発者に対しMacAppStore外で公開するアプリを公証するレビューなしの「Notary Service (Beta)」を開始。 | AAPL Ch. A notarized app is a macOS app that was uploaded to Apple for validation before it was distributed. When you export a notarized app from Xcode, it code signs the app with a Developer ID certificate and staples a ticket from Apple to the app. The ticket confirms that you previously uploaded the app to Apple. On macOS 10.14 and later, the user can launch notarized apps when Gatekeeper is enabled. When the user first launches a notarized app, Gatekeeper looks for the app’s ticket online. If the user is offline, Gatekeeper looks for the ticket that was stapled to the app. The first is to detect malware even faster than today before it gets distributed to our users. Second provide a finer grained revocation capability. So that we can revoke a specific version of a compromise. App as opposed to revoking the entire set signing certificate.